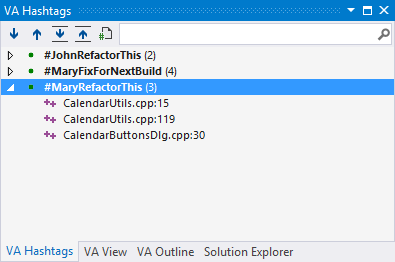 Visual Assist build 2062 introduces VA Hashtags—a combination of named bookmarks and task manager. Place hashtags anywhere in your comments and Visual Assist will let you navigate among them efficiently. Because VA Hashtags are embedded in comments, they act like bookmarks that move with your code. The “bookmarks” are accessible in all solutions that include your files. Embed names in VA Hashtags to use the feature as a task manager. A new tool window (Shift+Alt+H) lists all VA Hashtags in the current solution. Filter by name to see only “tasks” assigned to you. The window is refreshed automatically—as developers on your team create and delete hashtags. Visual Assist build 2062 also includes nice additions to Introduce Variable: the refactoring (Shift+Alt+Q) is now available from whitespace, and it can insert braces on separate lines. VA Snippets gets a few reserved strings that always expand month and day in English, and the options dialog for Visual Assist gets a new pane. Finally, build 2062 reduces the memory footprint for large solutions and fixes a number of outstanding bugs. Learn more about VA Hashtags, check out the complete list of what’s new, or download the installer.